SoundOff Signal, a global leader in LED vehicle lighting, control systems, and electronic warning solutions for the law enforcement, amber, and government markets announced today the Grid Light, an innovative new product in their mpower® silicone line. “We know safety is the number one priority when working in hazardous locations. We are proud to offer a new, high-quality solution that pairs increased visibility with the dependability that you have come to expect from SoundOff Signal,” says Mark Litke, president and chief executive officer. The Grid Light features a tricolor silicone pod, an industry-first in both color and lens technology. As the newest addition to the mpower product line, Grid Light delivers on the sustaining advantages of silicone over conventional, polycarbonate optical light lenses: high durability, versatile use, multi-color alternative to a beacon, and a brighter light output. In addition, Grid Light boasts an industry-leading 10-year warranty on the lens material. 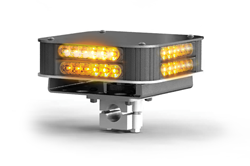 The Grid Light is designed for all types of vehicles including, but not limited to, department of transportation, municipal, construction, and snow plows. “We know safety is the number one priority when working in hazardous locations. We are proud to offer a new, high-quality solution that pairs increased visibility with the dependability that you have come to expect from SoundOff Signal,” says Mark Litke, president and chief executive officer. Grid Light is in production at SoundOff Signal headquarters in Hudsonville, Michigan, debuting at industry trade shows across the country June – August 2018. For additional product information, contact your local distributor or the SoundOff Signal customer service team at 800.338.7337. SoundOff’s mpower product line features silicone platforms with lighting options ranging from perimeter lighting that include many mounting options and also features the single, dual and tricolor capabilities, to full size lightbars. Since its launch in 2016, mpower® has become one of the most complete and robust portfolios in the industry! SoundOff Signal is a world class manufacturer of high-quality vehicle lighting and control safety solutions serving a wide range of customers globally. Our employees create intelligent, efficient and smartly designed safety solutions that work seamlessly together to improve vehicle visibility when it is needed most. We are committed to our customers and employees by creating value through strategic focus on innovation and quality within our business segments which has led us to 25 years of consecutive growth. For additional information, please visit http://www.soundoffsignal.com or follow us on Facebook, Twitter and LinkedIn.